A park is a park is a park. Or is it? In the case of Seonyudo Park it's quite an unusual city park that I think warrants a visit for architects, city planners, photographers, and park lovers alike. It's a prime example of a great ecological restoration initiative by the city in this case where an abandoned water filtration plant, and its surrounding land, was transformed into an urban green space. Today this park remains a favorite for couples and photographers alike for its unique setting and is, interestingly enough, a popular spot for wedding photo shoots. Seonyudo Park, as the "do" in the name implies, is located on Seonyu Island ("-do" for a location name often means an island). Just east of Seonyudo you'll come across the bigger and more famous island of Yeouido. Historically both these islands were well known for their scenic beauty along the Han River but because these islands were prone to flooding, they were primarily vacant as it wasn't particularly habitable nor useful for farming. In the decades of restoration and modernization following the Korean War, a water treatment plant was erected here providing drinking water for the burgeoning population of the capital but this plant too was later abandoned and the island sat largely ignored until the early 2000's when it was redeveloped into an urban park under the guidance of architects Jo Seong Ryong and Jo Kyeong Ka. What has resulted is quite a unique urban park and one that I find to be the most natural in that the transition between the nature park and its former facilities seems smooth rather than the jarring juxtaposition of elements that "parks" like the Seoullo 7017 appears to me. One popular spot is the glass house where Various fauna are housed in. The plants, although carefully maintained, are left to grow largely on their own. There are also concrete "tanks" of sorts leftover from the plant which has now been filled with water to create small makeshift ponds that are dotted with lotus leaves and other plants. Monet and his Impressionist buddies would have had a lovely time here. The park is an island, as mentioned, so the surrounding landscape is also quite nice. The north end in particular giving one a glimpse of Hapjeong and beyond as well as westwards to the Sangam area. My favorite part of the park is what I like to call the "sunken" portion. Staircases lead visitors to the parts of the park that are largely below ground level but with open skies. Here, concrete structures, bridges, walls have largely become overrun with ivies and other outdoor plants. What I appreciate about this mixture of natural and man-made elements is that the combination seems natural; there's no feeling that the plants have been methodically planned but at the same time its not completely overrun like an abandoned town. The closest comparison I can make is to the famous Secret Garden novel. Walking amid the grounds you almost feel like you'll uncover a hidden door somewhere leading you to a secret section. There's a pedestrian bridge that connects the island to the southern bank that's also famous. Not only for the scenic views but the way it lights up at night. A particularly lovely time to come here is at sunset which gives the park a glorious wash of orange and red hues that gives it a completely different feel. And once the sun has faded and the crowds dissipate as the night deepens, Seonyudo Island, home to no individual but home to nature, will continue its conversations amid the glowing lights of Seoul. 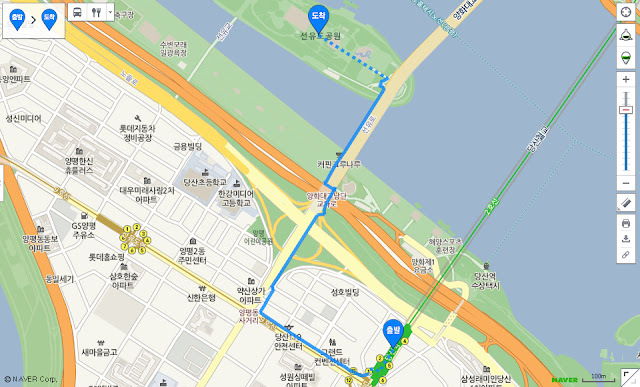 Final Thoughts: While Cheonggyecheon Stream and the recent Seoullo 7017 Park are the better known urban parks, the beauty and charm of Seonyudo Park is, in my opinion, unrivaled. Its natural allure is what makes it such a popular destination for photographers but even if you're just visiting the way the park changes in look and feel by the hour of the day and season of the year makes it a park that I would highly recommend 365 days a year. Come out of exit 1 one of Dangsan Station and walk along Yangpyeong-ro for about 370m. When yo u reach Seonyu-ro turn right and go up the street for about 80m until you see a small pedestrian crosswalk, cross and then continue up Seonyu-ro for about 650m, following the directions to Seonyudo Park.